Liver transplantation or hepatic transplantation is a medical surgical procedure performed on a patient suffering from the liver failure and is unable to to perform its normal functions such as synthesis of carbohydrates, proteins and fats. Liver failure is majorly caused by several disease conditions like liver cirrhosis, cystic fibrosis, hemochromatosis, primary biliary cirrhosis, primary sclerosing cholangitis and wilson’s disease. Liver transplantation is second most commonly transplantation surgery performed after the kidney, making it clear that liver disease is a common and serious problem. Majority of liver transplant operations use livers from deceased donors, though a liver may also come from another living person (allograft). Globally increasing awareness and spending on healthcare is expected to drive the demand for liver transplantation during the period of study. Geographically North America dominated liver transplantation market driven by best in the class healthcare infrastructure, advanced facilities and awareness and higher spending by the citizens towards healthcare expenditure. North America was followed by Europe and Asia-Pacific as second and third largest market for liver transplantation surgery market. Asia Pacific is projected to have fastest growth, owing to rapidly increasing healthcare infrastructure, increased spending, government initiatives and increasing awareness amongst population and growing medical tourism industry in developing nations such as China and India in this region. 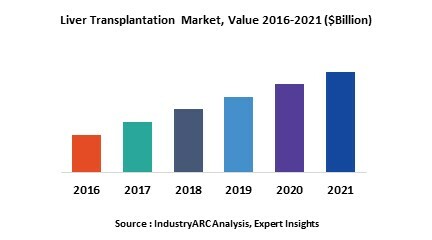 This report identifies the global liver transplantation market size in for the year 2014-2016 and forecast of the same for year 2021. It also highlights the market drivers, restraints, growth indicators, challenges and other key aspects with respect to global liver transplantation market.